The drug of choice, i.e., desire. All habitual drugs are tied to it—imitating it, emancipating it, preventing its re-uptake. Dopamine and it's connection to our lusting after the things of the world and our hating of restraint. The child is not in love with the toy. He is in love with the dopamine (sensation of pleasure) which contact with (or thinking or looking upon) the toy 'liberates' (emancipates) into the synaptic gaps of his nervous system. 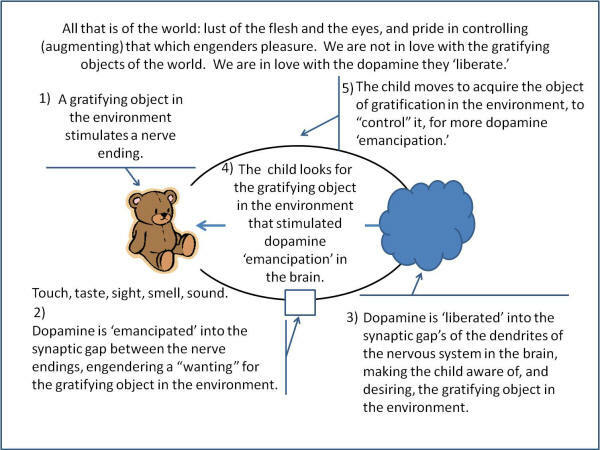 Dopamine is emancipated (liberated) into the synaptic gap between the nerve endings—along the way to the brain and between the dendrites and nerve endings in the brain (where the child becomes aware of the sensation of pleasure)—when the child's nerve endings come into contact with the environment or imagines their existence or potential existents. It is this sensation, i.e., "sense experience" (which comes as a result of dopamine being emancipated) that the child loves, correlating love ("sensuous need") to the thing(s) that stimulate it ("I will just die if you do not let me go out and play with my friends." "feeling"). 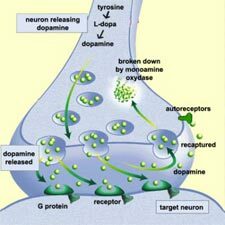 When we first come into contact with an object of pleasure there is a dopamine spike in the brain. From then on, thinking about the object of pleasure, anticipating coming into contact with it engenders a dopamine spike in the brain, resulting in there being less of a spike when we come into the contact with it. Over time, at the time of contact with the object there is little or no dopamine spike, interest has waned. This is why children loose interest in the toys they are given (sometimes within minutes), looking for a dopamine spike from something else instead. While the object of interest changes over time, i.e., the object that was of interest no longer simulates dopamine emancipation, the desire for ("lusting" after) the dopamine spike itself remains, with children looking for some other object to stimulate (trigger) it. As children anticipate (expect) this dopamine spike to be actualized in a new object of interest, it they can not have it, i.e., if the parent says "no," inhibiting or blocking them from having it, they becomes angry (in order to stimulate dopamine in the brain via. adrenaline, i.e., epinephrine—of course they are not aware that that is what they are doing). This is why children (including those in adult bodies) have tantrums (in order to raise the dopamine level in their brain—due to the absence of, i.e., the cutting off of the dopamine spike) when they can not have what they want, "NOW." Conversely, when children learn to do right and not wrong in whatever they are doing, tending to the chore or lesson at hand—not having to have, i.e., expecting a dopamine spike in order to do it (not, as a spoiled children, having to have a dopamine spike whether whatever they are doing is right or not, done or not done)—they tend to find satisfaction, a dopamine spike as a result of doing the job, and doing it right, not becoming angry or depressed if things go wrong, doing the job again in order to do it right, stimulating a dopamine spike, i.e., satisfaction when it is accomplished, i.e., done right. This is the difference between parent's wanting their children to do right and not wrong or wanting them to have a "better life," not that parents do not want their children to have a "better life," but that doing right and not wrong must come first. Unfortunately, after decades of "better life" (dopamine) mentality from parents to their children the marriage vow has been changed from "for better or for worse" to "till something better comes along." Children, not basing life upon dopamine spikes, i.e., their desire for the carnal pleasures of the 'moment' which the world stimulates, but upon doing right and not wrong, receive dopamine spikes from doing things right, not becoming angry, blaming others or the situation when things go wrong, being able to regroup in order to do things right—with the dopamine spike being a byproduct (an added blessing) for doing things right. Chastening, when children disobey, is in essence a "reboot," getting them off "lusting" after the dopamine spike and onto doing things right. It is an act of detoxing, i.e., getting them off the drug, i.e., getting the Karl Marx (love of pleasure and hate of restraint) out of them, resulting in their learning to humble, deny, die, control, discipline their "self" in order (as in "old" world order) to do right and not wrong, getting satisfaction, i.e., a dopamine spike as they do things right. "The heart is deceitful above all things [thinking pleasure (dopamine emancipation) is the standard for "good" instead of doing the father's/Father's will, i.e., doing right and not wrong], and desperately wicked [hating whoever prevents, i.e., inhibits or blocks it from enjoying the carnal pleasures of the 'moment' (the dopamine spikes) it desires]: who can know it?" Jeremiah 17:9 You can not see your hate of restraint as being evil with your "self," i.e., your love of pleasure is in the way, 'justifying' your hate, blinding you to the deceitfulness and wickedness of your heart. Without the father/Father and his love, which includes restraint, all you have is your hearts desire, i.e., your "lusts," i.e., your "self interests" and those who will use them to gain control of you, using you for their own gain and pleasure. On a sidenote: pain plays a part in the dopamine experience. All pain nerves send messages of pain to the brain in order to stay active and alive, with the brain ignoring them to a specific level. When a child, anticipating a dopamine spike, does not get it, i.e., something gets in the way, in order to emancipate dopamine in the brain, which he is missing out on, he gets angry (which emancipates dopamine in the brain). People can actually get pleasure out of being miserable, i.e., complaining, i.e., being a "victim," i.e., having a "pity party." In the process, the dopamine which he is artificially liberating in the brain raises the level of awareness of pain in the brain (which the pain nerves are sending). This is why missing out on pleasure is so painful (on an emotional level), i.e., why the child becomes so desperate ("desperately wicked"), striking out as to save his life, thinking he will die if he does not get his way, i.e., get his dopamine fix," "NOW." Over time, as the child persists in demanding his way, feeling like a victim of abuse (when he instead is the one abusing others, i.e., demanding his way), an imbalance between the number of vesicles (which create dopamine), receptors (which receive their message to send on up the nerve toward the brain), and the dopamine liberated in the brain results in anxiety, triggering (more readily) a reaction to (anger toward) the threat of missing out on the dopamine experience, if not physically, cunningly attacking (annihilating) any who he perceives as getting in his way. Whether the event itself stimulates dopamine emancipation in the brain, anticipation of the event (imagination) stimulates dopamine emancipation in the brain, or anger for missing out on the event which stimulates dopamine emancipation in the brain, they are all related to and effect the dopamine experience of the child, affecting the child's behavior—affecting whether he respects, honors, and obeys authority or questions, challenges, defies, disregards, attacks it instead. "Self" loves dopamine emancipation, becoming angry when it can not have it, especially when it is anticipated. While "self control" negates anger (in the child), "self esteem" stimulates ('justifies') it. While discussion, i.e., concern about doing or being right and not wrong, inhibits or blocks the dopamine spike before the event (of being or coming to the knowledge of what is right), dialogue, i.e., concern about "feelings," i.e., "feeling good" emancipates the dopamine spike, dialogue being the event itself—whether the results are right or not. "Self" love dialogue, where it can have it way, and hates discussion, where commands, rules, and facts can get in the way. "To enjoy the present reconciles us to the actual." 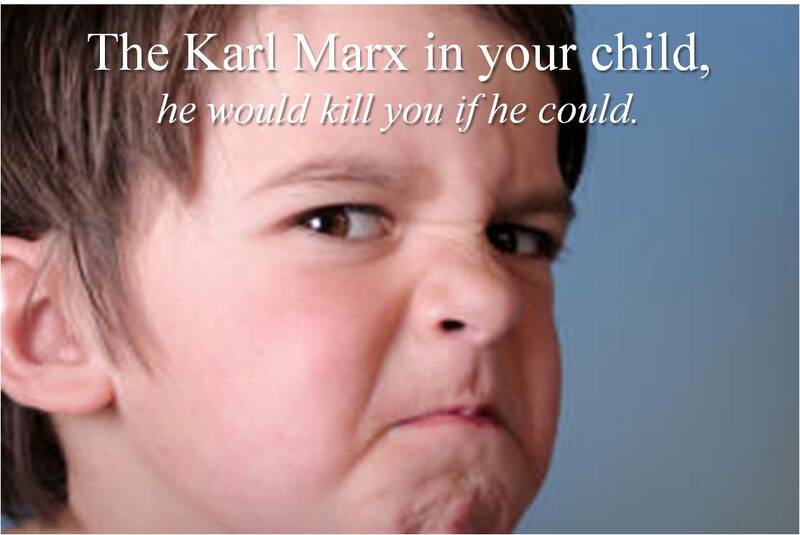 (Karl Marx, Critique of Hegel's 'Philosophy of Right') If you do not chasten the Karl Marx in your child, the Karl Marx in your child ("lusting" after dopamine emancipation, hating restraint) will rule over his life (and yours). If it were not for the Karl Marx in the heart of man, "lusting" after dopamine emancipation, and the world which stimulates it, Marxism would not work (which it does not, with utopia, i.e., "lusting" after pleasure, i.e., dopamine spikes always ending in anger, destruction, and death, i.e., wickedness). According to Marx, why have a piece of the world, i.e., private property, when you can have it all, globalism. Man's love, no matter how caring, is taken captive to his love of pleasure, i.e. to his love of the flesh, i.e., to his "lusting" after dopamine emancipation. Man is 'driven' in identifying and 'purposed in "controlling" that which stimulates the sensation of pleasure, not knowing that it is the sensation of pleasure that "controls" him. The woman was not in love with the "forbidden tree" in the garden in Eden, she was in love with the dopamine 'emancipation,' i.e. the sensation of pleasure it stimulated within her every time she went by it, making the sensation of pleasure the standard whereby to determine right from wrong, good from evil, establishing "human nature," her love of the things of this world over and against God's authority. Genesis 3:1-6 is the "children" establishing themselves, i.e. their "human nature," i.e. their love of dopamine 'emancipation' over and against their Father's authority, negating the Father's authority, i.e. Hebrews 12:5-11, thereby negating the "guilty conscience" which the Father's authority engenders, i.e. Romans 7:14-25., 'liberating' man to "do as he pleases," i.e. "lusting" after the things of the world with no "guilty conscience." It is here that the master facilitator of 'change' could seduce, deceive, and manipulate, not only the woman, but all of mankind into disobedience to God, by "helping" us 'justifying' ourselves according to our carnal desires, deciding right from wrong according to how we "feel," i.e. according to our "lust" for dopamine 'emancipation.' Adam was not deceived. He knew better. This makes the woman the first "environmentalist," i.e. choosing the sensation of relationship with the environment over and against the authority of God, and Adam the first "humanist," i.e. choosing the woman (the sensation of "human relationship") over and against the authority of God. It makes them both liberals, blaming someone else (or something else or the situation) for their troubles, throwing them "under the bus." All the "educator" has to do is 'create' a classroom environment where children can "safely" (with no fear of judgment, chastening, condemnation) share with one another their "self interests," i.e., dialogue their opinions to a consensus, i.e., to what they can all agree upon, affirming their "lusting" after the carnal pleasures of the 'moment,' i.e., their "lusting" after dopamine emancipation which the world stimulates and their resentment, i.e., hatred toward anyone who restrains them, i.e., who prevents them from having and enjoying it, i.e., who prevents them being themselves, i.e., of the world only, and children by nature will establish themselves, i.e., their carnal desire for the pleasures of the 'moment,' i.e., their "lusting" after dopamine emancipation over and therefore against any authority, i.e., the father's/Father's authority which—not 'justifying' their carnal nature, i.e., their "lusting" after dopamine emancipation, requiring them to "humble," "deny," "die to" their "self," i.e., to their "lusting" after dopamine emancipation—gets in their way, 'creating' a world (a "utopia," i.e., fables and stores, laden with "feelings') out of their own making, according to their imagination, requiring all to live in it, i.e., a world of spoiled, selfish, tyrannical children full of hate and rage when they do not get what they want, when they want it, who, like drug addicts, silence, remove, negate, kill anyone (including the unborn and the elderly) who gets in the way of their "lusting" after pleasure, i.e., dopamine emancipation. Money is simply stored up drug money, i.e. stored up dopamine which money can release in the future in the form of a vacation, good food, a new outfit, a new home, the praises of men, etc. It is why we get a rush of dopamine on pay day, i.e. thinking about the things we can do or buy with our paycheck. You could make a long list of things which trigger the emancipation of dopamine within you when you come into contact with or think upon them. It is not that pleasure, money, i.e. dopamine is evil in and of itself. God created us to enjoy the things of this world while we praise him for creating them. It only becomes evil when we choose to enjoy it over and against His will, worshiping the pleasures of the flesh rather than He who created it, i.e. instructing us in how to live our lives, letting Him work His perfect will out through our lives by yielding ourselves to Him, thinking and acting according to His Word and the power of His Holy Spirit, for His glory, filling us with his love, joy, and peace which the world can never understand. The Apostle Paul wrote of the power of dopamine emancipation (of "the law of the flesh") and it's "control" over you. "O wretched man that I am! who shall deliver me from the body of this death?" Romans 1:24 If you can walk away from pleasure you control it. If you can not, it controls you. The answer to your sinful nature, i.e. to your "lusting" after dopamine 'emancipation' can not be found in you, in man, or in the world. It can only found in Christ Jesus, who, in obeying His Father's will in all things commanded, to the death, over and against the "lust" of dopamine 'emancipation,' overcame the power of the world, i.e., our flesh, i.e., our love of dopamine emancipation, who, by his shed blood on the cross, 'redeemed' you from God's judgment upon you for your sins, i.e., for your "lusting" after this world and the dopamine emancipation which it stimulates, 'reconciling' you to his Heavenly Father, in the Father's raising him from the grave that you might spend eternity with Him and His Father, in their joy, love, peace, and holiness instead of in the lake of fire that is never quenched, where there will be no pleasure, i.e., no dopamine emancipation, only torment and anguish. "For God so loved the world, that he gave his only begotten Son, that whosoever believeth in him should not perish, but have everlasting life. For God sent not his Son into the world to condemn the world; but that the world through him might be saved. He that believeth on him is not condemned: but he that believeth not is condemned already, because he hath not believed in the name of the only begotten Son of God." John 3:16-18 On the day of judgment you can not blame anyone else for where you will spend eternity. You can only blame your self. It is your choice to make today. Again: only in God's love is true love found, loving that which is unlovable, i.e. loving us while we were yet in our sins, i.e. loving us while we were still taken captive to our love of pleasure, "lusting" after the things of this world which stimulate dopamine emancipation in us, sending His only begotten Son to die for us, covering our sins with His blood, 'redeeming' us from His Heavenly Father's wrath upon us for our sin, i.e., love of dopamine emancipation, 'reconciling' us to His Heavenly Father, who in holiness, raised him from the grave according to His righteousness, imputing His righteousness to us by His grace, requiring us to have faith in Him alone "lest any man should boast," and filling us with His Holy Spirit, that we might know His love, joy, and peace as well as think and act according to His will, being able to do that which He desires of us, i.e. living in righteous before Him and the world, being able to thinking and acting according to His Heavenly Father's will, as He does.